A simple schoolyard fight can easily escalate from school suspensions or detentions to charges of assault and battery punishable by time in jail or a civil lawsuit. When police officers intervene in a school fight, they may arrest the participating students on assault and battery charges, based on the victims of the crime, the severity of injuries, and the weapons used. In general, battery is legally defined as any offensive touching, so even a slap, shove or kick can legally be called a battery offense. If school fights get out of hand and one or more children suffer significant injuries that require immediate medical treatment, criminal charges, and civil lawsuits are much more likely, often requiring the intervention of a criminal attorney. Today, some schoolyard brawls between older kids involve dangerous weapons such as knives, guns, and baseball bats, all of which are considered lethal weapons. 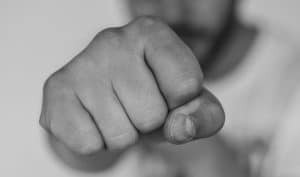 These types of fights usually inflict significant injuries and warrant criminal arrests, penalties, and civil liability. Fights between younger kids usually involve punching, slapping, kicking, shoving, and wrestling which are unlikely to result in serious injuries, other than a bloody nose or black eye. In some cases, schoolyard fights may be the result of bullying. Under new Minnesota bullying laws, bullying can be punishable by criminal charges. These new laws give school administrators and teachers more power to deal with students who abuse and mistreat other children and create criminal punishments for the worst offenders. In Minnesota, minor children charged with crimes go to a separate court system for juveniles. Penalties are less harsh than adult penalties for the same crime, and judges often impose house arrest. detention, probation, or community service as an alternative to jail time. However, if a firearm is used in the fight or the victim’s injuries are severe, a juvenile may be charged as an adult. Under Minnesota law, a simple assault is charged as a misdemeanor punishable by up to $1,000 in fines and up to 90 days in jail. If bodily harm is inflicted, the perpetrator may be charged with a gross misdemeanor or felony, depending on the circumstances of the incident. If significant injuries result and a lethal weapon is used, the perpetrator may be charged with a felony offense punishable by fines that range from $10,000 to $20,000 and jail time that ranges from 5 to 20 years.